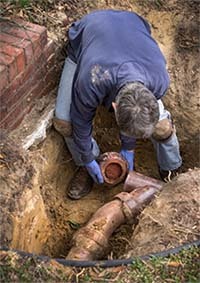 When it’s time for sewer repair in Azle, TX, call the experienced plumbers at Lightfoot. We’ll come to you quickly because we know that sewer problems can’t wait. We’ll assess your sewer swiftly and accurately and help you figure out exactly what needs to be done to get your home running well again soon. Then, we’ll put the plan into action and fix your sewer fast. We’ll start assessing your home for sewer repair in Azle, TX by sending a camera down your sewer line. It’s attached to a flexible cable and allows us to see the entire circumference of your pipe. This means that we can find clogs, leaks, tree roots, and anything else that might be hampering the way your sewer works. Once we’ve found the problem, the solution will be clear to our experienced plumbing staff. Whenever possible, we’ll do trenchless sewer repair in Azle, TX. These repairs use technology to repair your pipes with a minimum of digging. You’ll save your yard, save money, and not risk health hazards that can come with digging holes in your yard. If you think you might need help with your sewer soon, don’t hesitate to call us today. We’ll get there fast and help mitigate the damage that a sewer backflow can cause. Once we’ve stopped the flow of sewage into your home, we’ll get started on repairing your sewer. We won’t ask you to live very long without full usage of the water in your home! When you need reliable plumbers who have years of experience in sewer repair, call Lightfoot. Find out for yourself exactly why so many people in Azle, TX call us every time they have a plumbing issue.